Jakarta. Asia-focused financial services startup Oriente Investment Holding, in a collaboration with Indonesian conglomerate Sinar Mas, have launched a new fintech platform called Finmas to cater to loan demand from Indonesia's large unbanked population. The launch party for the new platform was held in Jakarta last Thursday (14/02), attended by the most important figure behind Oriente, Geoff Prentice, who co-founded the popular video-call app Skype in 2002. "We are really glad to be able to launch a platform in line with the OJK's [Indonesia's Financial Services Authority] goal to improve financial inclusion in the country," said Peter Lydian, president director of Oriente Mas Sejahtera, the company that operates Finmas. Finmas now offers cutting-edge mobile and data science technology to target potential customers in Indonesia, even if they have no credit history. Peer-to-peer lending is available on the application to attract low-income employees and micro businesses to join up as customers. Oriente and Sinar Mas Group entered their strategic partnership in January last year. 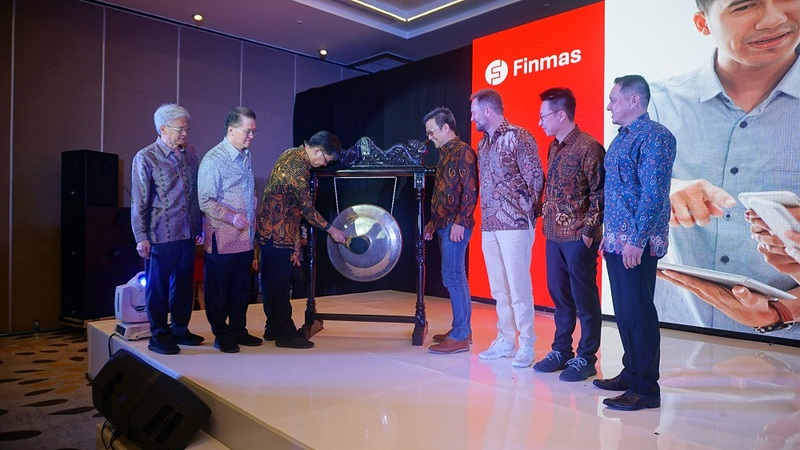 After registering their platform with the OJK in February, a beta version of Finmas offering a cash loan was launched in September. Until February, the Finmas app has been downloaded by more than 1 million users on Google's Play Store and Apple's App Store. Other high-profile figures in the financial industry also attended the Finmas launch party, including Lawrence Chu, co-founder of Oriente, Franky Widjaja, a member of the second generation of family who controls the Sinar Mas Group, and Hendrikus Passagi, the OJK's fintech permit and supervision director. There were also representatives from Indonesia's financial technology association Aftech and the Indonesian Fintech Joint Funding Association (AFPI). Franky said the Sinar Mas Group is keen to learn new ways to to reach the "young generation and the country's unbanked population." Hendrikus said the OJK has high hopes for Finmas, while highlighting four major problems that the new platform can help figure out. According to OJK's data, a whopping 66 percent of 260 million Indonesians—the country's total population—either have no bank accounts or have zero access to banking services. Industry reports estimate there is a blue ocean business to be made in providing loans to this population, worth up to $54 billion until 2020. The four major problems that the country is facing are: an under-served and under-banked population, a large total population and also a large population of micro, small, and medium enterprises (MSME)—many of whom also don't have access to financial services from banks. "We hope that fintech can be a solution to these problems. In our country, fintech should be an upstream-to-downstream value-chain financial service," Hendrikus said. As Finmas' technology backer, Prentice said the platform will help to unlock potential Indonesian customers through customized "purpose-based financing." "Through Finas, we are building a reliable alternative traditional credit risk assessment," he said. Oriente has already laid out plans to spend an initial funding round of $105 million to scale up its business across Southeast Asia. Aside from Finmas in Indonesia, the fintech startup is also running a lending platform in the Philippines and is planning an entry to the Vietnamese market. "But Indonesia will be the country to contribute the most [to our business]. If something bad happens to Indonesia, we would be in big trouble," Prentice joked. Indonesia has already seen an influx of fintech lending platforms, with mixed results. Some of them are operating illegally and have been blamed for employing debt collectors to intimidate their customers. These illegal fintech platforms, many of them from China, have attracted the attention of the OJK after many of their customers complained of data theft and unethical debt-collection. Finmas' Peter Lydian said the platform will always make sure it complies with Indonesian fintech regulations.